Math. It’s not everyone’s cup of tea. In fact, some of us hate it. But what if we could make math fun? Maybe even a little bit humorous? In our math videos for kids, we welcome a quirky cast of characters that’ll teach us how to count by 2s, 5s, and 10s. 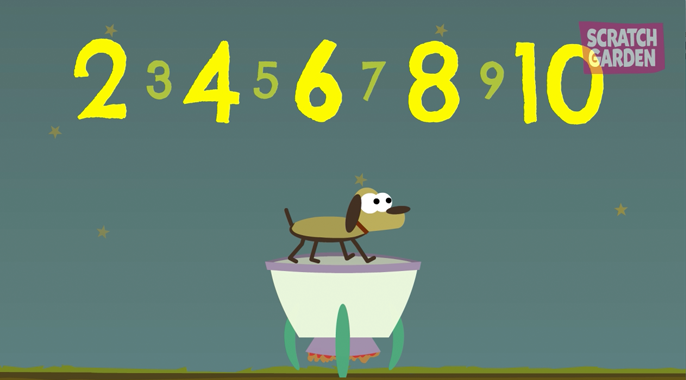 These math videos are a fantastic way to get kindergarten and first grade students interested in the wonderful world of numbers. One, two, three, four, five, six… counting the regular way gets boring after a while. It’s time to move on to something a little different. Skip every second number and you’re counting by twos. Introducing counting by twos. It’s twice as fast! And twice as fun! 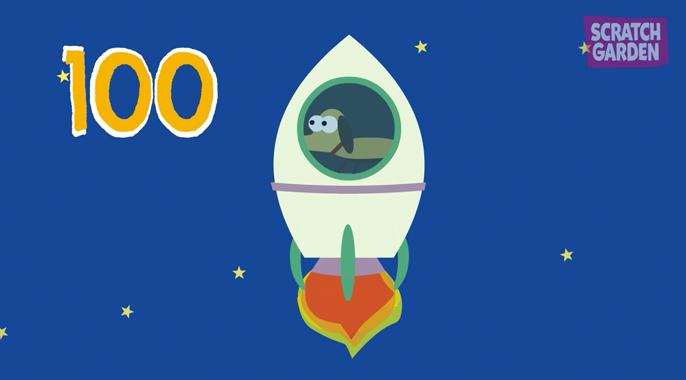 Join a friendly pup as it takes off into outer space on rocket ship, counting by twos as it soars higher and higher into the night sky. We’ll land on the moon. We’ll make it to Mars. All by counting by twos. Our songs to teach how to count by twos are interactive. We always encourage kids to sing (in this case, count) along. Let’s hear it: TWO, FOUR, SIX, EIGHT. WATCH THE VIDEO. DO NOT WAIT! Let’s fly even deeper into outer space. Let’s count by fives! This counting by fives video is a fun and informative way to teach youngsters their five times tables. Make things even easier by sharing this simple tip: when counting by fives, each number ends in a five, then a zero. Teach kids to count by fives all the way to 100! As we introduce counting by fives, we’ll build up, and up, and up, and up until we count all the way to 100! It’s a long way back to Earth, so don’t look down. Ready to boost your kids’ or students’ math skills with our fun videos for counting by five? Sing it with me: FIVE, TEN, FIFTEEN, TWENTY. WATCH THE VIDEO FOR LAUGHS A-PLENTY. INCOMING CALL. INCOMING CALL. INCOMING CALL. Join the friendly pup and his new companion, the space fish. A holographic space fish is trying to contact you. Listen up – it wants you to count by tens. Oh, and here’s another tip to make it even easier: when counting by tens, count up by ones and add a zero. 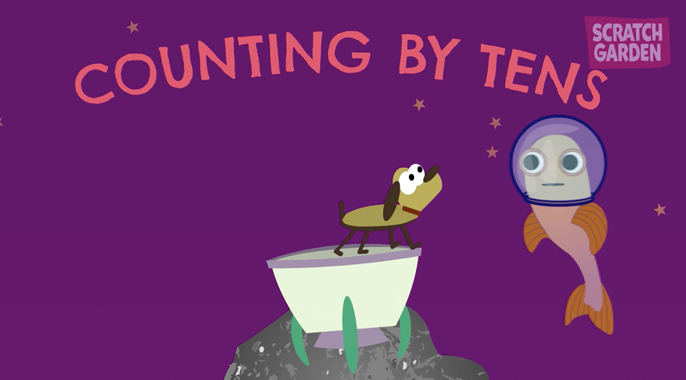 This wacky counting by tens video for kids makes math fun. Wait, did we really just say that? For the last time, raise your voice: TEN, TWENTY, THIRTY, FORTY. WATCH THE VIDEO. DON’T BE NAUGHTY. Check out our three math resources for kids. These songs are an easy way to teach kindergarten and first grade students how to count up by twos, fives, and tens.